Home » What Are the Most Reliable Sources about Jesus? What Are the Most Reliable Sources about Jesus? 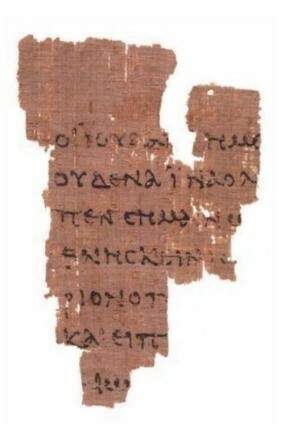 P52, a papyrus fragment of John dating from the early 2nd century. This is a brief summary of a longer, heavily documented article, “What are Good Sources about Jesus?” (Part 2 in the series “The Bottom-Line Guide to Jesus”). The existence of Jesus of Nazareth, a Jewish teacher from Galilee executed by crucifixion at the order of Pontius Pilate, is well-established historical fact. But where can we find reliable information about him? For Christians, the best sources are the four New Testament Gospels: Matthew, Mark, Luke, and John. However, many people today challenge their reliability and often tout other writings as superior sources of information about Jesus. If we are to know the truth about Jesus, we need to know how reliable the available sources are. To gauge the historical value of these books, we need to consider (1) the textual evidence, (2) when and by whom they were written, (3) what sort of books they are, and (4) how well they fit Jesus’ historical context. The four New Testament Gospels enjoy extensive ancient textual evidence. We have multiple fragments of Gospel manuscripts from the second and third centuries, including a fragment of John copied perhaps 25 years after it was written. We have complete copies of all four Gospels in their original Greek language from the mid-300s and thereafter. This manuscript evidence is far superior to that of all the other books about Jesus. Indeed, it is much better than the manuscript evidence for virtually all other ancient writings. By contrast, the ancient textual evidence is sparse for the ancient apocryphal gospels. We have no complete copies of any of them in their original Greek text. For example, there is just one fourth-century copy of the Gospel of Thomas in Coptic and a few earlier fragments in Greek. And that’s better than the others. We have no complete copies in any language of the Gospel of Peter or the Gospel of Mary. At least we have some ancient fragments of these books. We have no ancient textual evidence for any of the others. The earliest copy of the Gospel of Barnabas was made about 1600 in Italian! The earliest known text for the Book of Mormon is the one Joseph Smith dictated in 1829. Nicolas Notovitch claimed that his 1894 Life of Saint Issa was based on scrolls read to him by Buddhist monks in Tibet, but investigators determined that no such scrolls ever existed. Since Jesus was crucified in either AD 30 or 33, the closer a source is to those dates the better. The scholarly consensus dates all four Gospels between about AD 50 and 100, within the lifetimes of at least some of the eyewitnesses who knew Jesus personally. The Gospels do not name their authors, but Christians in the early second century (about AD 100 to 125) identified the authors by name. The ancient apocryphal gospels trumpet the names of their supposed authors—Thomas, Mary, Peter, etc.—but no scholars think they were the actual authors. These books were probably written in the second century, one or two generations too late to be produced by eyewitnesses or by anyone who knew the eyewitnesses. The other books are hopelessly too late in this regard. The Gospel of Barnabas was probably written between 1320 and 1348, thirteen centuries after the time of Jesus. Despite efforts by their defenders to prove otherwise, the Book of Mormon and Life of Saint Issa clearly originated in the nineteenth century. The New Testament Gospels are written in the style of ancient Greco-Roman biographies, just what one would expect if the Gospels were ancient sources about Jesus. For example, like such ancient biographies but unlike modern ones, they spend little or no time on Jesus’ youth and focus largely on the most momentous period of his life, which was the week of his death. The ancient apocryphal gospels do not qualify as biographies in any sense. Generally speaking they contain little or no narrative and don’t even claim to present historical information about Jesus. The later apocrypha have the opposite problem: They are fraudulent biographies or histories. The Gospel of Barnabas is an extremely lengthy “harmony” of the New Testament Gospels, weaving their contents together along with new material generally reflecting an Islamic perspective. The Book of Mormon’s narrative about Jesus purports to be historical but is not a biography of Jesus, since it says almost nothing about the life of Jesus prior to his resurrection. The Aquarian Gospel of Jesus the Christ looks like a modern biography, correcting the supposed deficiencies of the New Testament Gospels. Thus, much of the book tells stories about Jesus’ childhood and about his travels as a young adult to India, Persia, Assyria, Greece, and Egypt. While we cannot “prove” every detail of the New Testament Gospels, their accounts about Jesus fit extremely well in the context of his first-century life in Galilee and Judea. The Gospels report Jesus going to real places, engaging with real people, and teaching on subjects that were burning issues among the Jews of his day. The same cannot be said for the other books, all of which betray their later origins. The Gnostic gospels portray Jesus spouting statements that owe more to Platonic philosophy than to the Old Testament. The Gospel of Barnabas weaves material from the New Testament Gospels together into one long book in which Jesus is quoted presenting common medieval Islamic arguments against Christianity. The Book of Mormon presents Jesus quoting almost verbatim the entire Sermon on the Mount as recorded in Matthew (in the King James Version), including cultural references that would make no sense to his supposed ancient audience in the Americas, such as roads leading to gates of walled cities (which didn’t exist in the first-century ancient Americas). Of all the texts surveyed in this brief overview, only the New Testament Gospels pass the tests scholars apply to literary works that claim to be ancient historical or biographical texts. The following chart summarizes how works from each category measure up to these common criteria. If we want to know the facts about Jesus, then, we need to go to the New Testament Gospels.